Read about our successes across the United States. AFLSE chapters have been active throughout the United States, as demonstrated by the Annual Bon Voyage Programme which ran from the end of July until the end of August, including events in Boston, Chicago, Cleveland, Dallas, Denver, Houston, Los Angeles, New York City, Philadelphia, San Francisco and Washington, DC, plus a South Florida “happy hour” arranged by the LSE Alumni Relations. The programme encourages alumni to share their experiences of living and working in London with new students en route to study at the LSE, and for the students to network and make contacts with others about to embark on the same adventure. Many thanks to Anna Sabasteanski (1980) for organizing a most successful Bon Voyage reception at the British Consulate General, attended by 60 guests, including alumni, 26 students and a number of parents. Many thanks also to James Constable (1982) for his most generous sponsorship of the event, and also to Paulyn Low (2001) for assisting on the day. The Vice Consul welcomed everyone. People admired the splendid view over the Charles River, came early, left late, and students and parents were convinced that the LSE is a great school! The Chicago student party was held at the Fadó Irish Pub on August 23, hosted by Kristin Lingren, chapter chair. An enthusiastic group of more than 20 students en route to the LSE were joined by 16 alumni and friends for a fun event. Ohio chapter alumni Breck Platner, Stuart Freidman, Brady Calestro, Matt Weinbaum and guests, wished a bon voyage to 6 students heading off to LSE in September at a cookout on Wednesday evening, August 29th. The students got to hear first hand experiences about LSE and life in London from the 1970's through 2004 while eating hamburgers and watching the sunset on Lake Erie. One is attending as an undergraduate and the other five are enrolled in master's programs. A Bon Voyage “happy hour” for alumni and students was held on August 30, at the Trinity Hall Pub. Many thanks to Michael Anderson and Keith Rhodus for organising the event. The Pints Pub was the setting for this year’s Bon Voyage event in Denver on August 23, with Kevin Lynch, British Consul, as guest of honour. We had an impressive turnout at the Bon Voyage party last week at Pint's Pub in Downtown Denver. We were lucky to be graced by British Consul Kevin Lynch and his assistant Peter, who will be taking the course in Public Administration. We had a handful of alumni and seven matriculating students -over three of them will be in Media Studies course, and two will be taking the General Course. Consul Lynch invited us to have the next event at his place, so we're looking forward to another stimulating alumni event. Chapter leader John Mgbere, arranged a Bon Voyage event at the Black Labrador Pub on August 20, where new students were hosted by alumni. John Charman hosted Julie Knutson and husband, and Janet Moore at the Black Labrador Pub on August 20 and they offered advice to new students who joined for a prolonged 'happy hour." Both General Course and Masters level students came to seek advice from alumni. For the third year in a row Bob Pierce, HM Consul General, together with his wife Sharon Harroun Pierce, hosted a reception for the Los Angeles chapter at his residence on Tuesday, August 21. Chapter leader, Emily Burg, reports that a total of more than eighty people (40 new students, 26 alumni, parents, partners and other guests) gathered to enjoy cocktails and canapés during a beautiful summer evening, and to share stories about life in London and of course at the LSE. Alumni, notably recent graduates enlightened students about to cross the pond about where to have a pint, do their banking and book their Eurail passes! During the summer months, John Casey, and co-chairs Normand Morneau, Gary Klein and new co-chair Connor Galvin, organised a range of activities for New York alumni. In addition to the 7 O’clock Club, a happy hour held on the first Monday of every month, the annual Pub Quiz took place on July 11, and the Evening in Central Park with the New York Philharmonic on July 11. The New York Bon Voyage party, held on August 9, was once again a great success, attracting 135 people including nearly 70 students, more than 40 alumni and 15 other guests, including Mary Blair, Director of ODAR at the LSE. Chapter leaders, John Casey, Norm Morneau, Connor Galvin and Gary Klein were on hand at the mid-town Croton Reservoir Tavern to greet and advise the enthusiastic students who appreciated the opportunity to network with each other as well as learning from the experiences of those who have already studied at the LSE. Rich Stein, long-time chapter leader, invited students and alumni to his home for an afternoon barbecue on August 18. He reports that they had a delightful mix of people, including 3 alumni and 10 departing students, (MS, transfers, General Course and year abroad, who will be studying a variety of topics), some parents, siblings and a couple of friends. The weather was great, and we had pizza, salad and a variety of beverages--and, of course, ice cream--on our deck, under the trees and the stars, in Penn Valley. Most of the people did not know each other before the party (two attended the same camp as children! ), so many email addresses and phone numbers were exchanged. Many will be living in LSE housing, while a few are venturing into the larger realm of London rentals. This year, the Bon Voyage send-off, organised by chapter leader Augi Anagnostos- Paleokrassas (1991) was held at the King George Hotel and was attended by about 35 students and a number of alumni and guests. 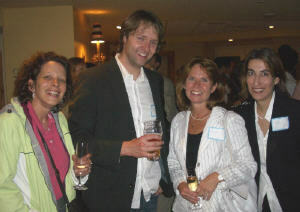 Augi reports that the 2007 Bon Voyage party of the SF alumni was a HUGE success! The British-styled pub venue provided the perfect backdrop to the newly-admitted students' sendoff. We toasted the new admits with a complimentary glass of champagne. The heavy snacks were also well-received. Most of the attendees were students, who, by the end of the evening had exchanged emails, addresses and had made plans for the future in London. There was a wonderful buzz all throughout the reception, which quickly spilled out of pub area. All were excited to begin this new chapter in their lives in London. We wish them all well!" Click here to view photos from the event. A happy hour was held July 11 at Marazul for AFLSE members, recent grads, future students, and friends. Very many thanks to Joy Dunkerley, (1953) who once again opened her home and graciously hosted the Bon Voyage event, attended by 65 guests, including 40 students (some of whom had traveled from as far away as Michigan), 18 alumni (including chapter leader Olga Chistyakova, and former AFLSE presidents Ann Schneider and Patricia Stockton), as well as parents and friends. As usual, the event provided a great opportunity for networking between students and alumni, and many of those who raved about the heat and humidity of the Washington summer afternoon seemed reluctant to leave.